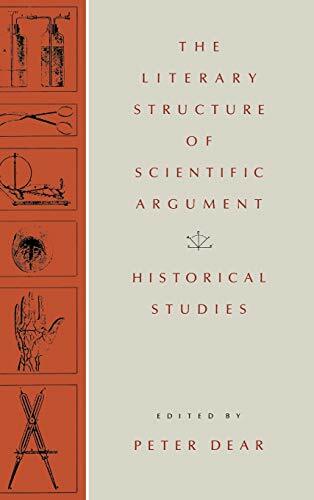 The Literary structure of scientific argument : historical studies / edited by Peter Dear. J. C. Reil and the "Journalization" of physiology / Thomas H. Broman -- Writing zoologically : the Zeitschrift für wissenschaftliche zoologie and the zoological community in late nineteenth-century Germany / Lynn K. Nyhart -- Rigorous discipline : Oliver Heaviside versus the mathematicians / Bruce J. Hunt -- Setting the table : the disciplinary development of eighteenth-century chemistry as read through the changing structures of its tables / Lissa Roberts -- Narratives, anecdotes, and experiments : turning experience into science in the seventeenth century / Peter Dear -- Argument and narrative in scientific writing / Frederic L. Holmes -- Eighteenth-century medical education and the didactic model of experiment / Lisa Rosner. 04^aThe Literary structure of scientific argument :^bhistorical studies /^cedited by Peter Dear. ^aPhiladelphia :^bUniversity of Pennsylvania Press,^cc1991. ^avi, 211 p. :^bill. ;^c24 cm. 0 ^aJ. C. Reil and the "Journalization" of physiology / Thomas H. Broman -- Writing zoologically : the Zeitschrift für wissenschaftliche zoologie and the zoological community in late nineteenth-century Germany / Lynn K. Nyhart -- Rigorous discipline : Oliver Heaviside versus the mathematicians / Bruce J. Hunt -- Setting the table : the disciplinary development of eighteenth-century chemistry as read through the changing structures of its tables / Lissa Roberts -- Narratives, anecdotes, and experiments : turning experience into science in the seventeenth century / Peter Dear -- Argument and narrative in scientific writing / Frederic L. Holmes -- Eighteenth-century medical education and the didactic model of experiment / Lisa Rosner.